b. 53 x 59 drilling rod adopted, high rigidity and strong delivery torque. c. the machine is equipped with national patent technology---taper clutch, with charactristics of strong transmission troque, easy operation and free maintenance. d. for the winch, we use large module planetary gear and add supporting frame, greatly increasing hoisting and braking ability of the winch. 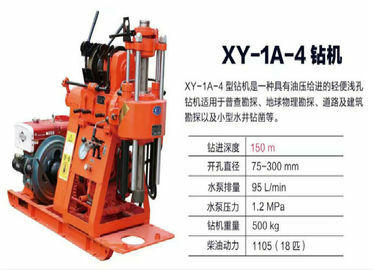 e. Vertical spidle are fixed by four groups of bearings to ensure that the rotary machine is rigid enough for gravel layer and other complex geoloical conditions.